Only use child restraint systems that are officially approved and suitable for the child. 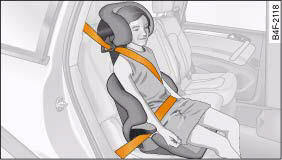 Child restraint systems are covered by the European standard ECE R 44 (issued by the Economic Commission of Europe). 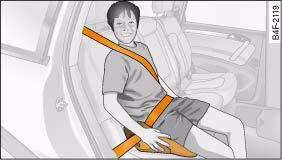 Children who are taller than 1.5 metres can use the existing seat belts without a booster cushion. Child restraints that have been tested and approved under the ECE R 44 standard bear the ECE-R 44 test mark on the seat (the letter E in a circle with the test number below it). 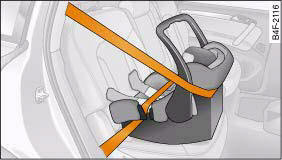 A suitable child safety seat and a correctly worn seat belt can protect your child. Babies up to about 9 months old / 10 kg and infants up to about 18 months old / 13 kg are best protected by child safety seats that can be adjusted to a horizontal position ⇒ fig. 226. Follow the manufacturer's instructions and observe any statutory requirements when installing and using child restraints, “Important safety notes for using child safety seats”. Never install a rearward-facing child safety seat on the front passenger's seat if the front passenger's airbag has not been deactivated. This can result in serious or possibly fatal injury. Babies and small children up to about 4 years of age weighing between 9 and 18 kg are best protected by child safety seats of the type where the child faces the front of the vehicle ⇒ fig. 227. Children up to about 12 years of age weighing between 15 and 36 kg but less than 1.5 metres tall are best protected by a child safety seat in conjunction with the three-point seat belts ⇒ fig. 228 and ⇒ fig. 229. The diagonal part of the belt should be positioned roughly over the centre of the shoulder and fit closely against the upper part of the body. It must never be allowed to run across the neck. The lap part of the belt should fit closely over the hips. It must not be positioned over the stomach. Pull the belt tight if necessary to take up any slack. 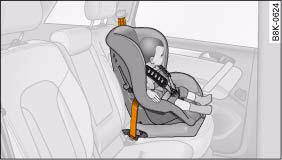 We recommend that you fit child safety seats with backrests.